I thought it might be fun to see what kind of poetry I could find for Shark Week. 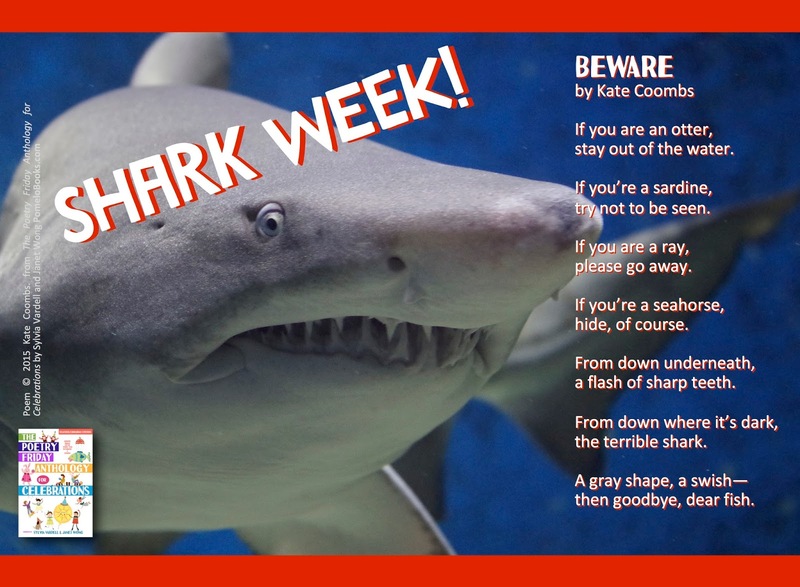 Of course we have a "Shark Week" poem in The Poetry Friday Anthology for Celebrations (Pomelo Books, 2015), thanks to the awesome Kate Coombs. It's a nice blend of creepy and chant-worthy. But as I started digging, I found a few shark poetry books and a bunch of sea-ocean-fish poetry collections, including a brand new gorgeous anthology from Lee Bennett Hopkins coming out this fall (Traveling the Blue Road: Poems of the Sea.). See if any of these grab you! Bingham, Kelly. 2010. Shark Girl. Somerville, MA: Candlewick. Brown, Skila. 2016. Slickety Quick: Poems about Sharks. Ill. by Bob Kolar. Somerville, MA: Candlewick. Bulion, Leslie. 2011. At the Sea Floor Café; Odd Ocean Critter Poems. Ill. by Leslie Evans. Atlanta: Peachtree. Coombs, Kate. 2012. Water Sings Blue: Ocean Poems. Ill. by Meilo So. San Francisco: Chronicle. Elliott, David. 2012. In the Sea. Somerville, MA: Candlewick. Florian, Douglas. 1997. In the Swim. San Diego, CA: Harcourt Brace. Frank, John. 2007. How to Catch a Fish. New Milford, CT: Roaring Brook. Franco, Betsy. 2015. A Spectacular Selection of Sea Critters. Ill. by Michael Wertz. Brookfield, CT: Millbrook. Harley, Avis. 2006. Sea Stars: Saltwater Poems. Honesdale, PA: Wordsong/Boyds Mills. Hauth, Katherine. 2011. What’s for Dinner? Quirky, Squirmy Poems from the Animal World. Watertown, MA: Charlesbridge. Heard, Georgia. 1992. Creatures of Earth, Sea, and Sky. Honesdale, PA: Wordsong/ Boyds Mills. Hopkins, Lee Bennett. Ed. 2017. Traveling the Blue Road: Poems of the Sea. New York: Quarto/Seagrass Press. Lewis, J. Patrick. Ed. 2012. National Geographic Book of Animal Poetry. Washington DC: National Geographic. Maddox, Marjorie. 2008. A Crossing of Zebras; Animal Packs in Poetry. Wordsong/Boyds Mills Press. Ode, Eric. 2013. Sea Star Wishes: Poems from the Coast. New York: Sasquatch Books/Random House. Shaw, Alison. Ed. 1995. Until I Saw the Sea: A Collection of Seashore Poems. New York: Henry Holt. Swinburne, Stephen. 2010. Ocean Soup; Tide-Pool Poems. Watertown, MA: Charlesbridge. Zahares, Wade. 2001. 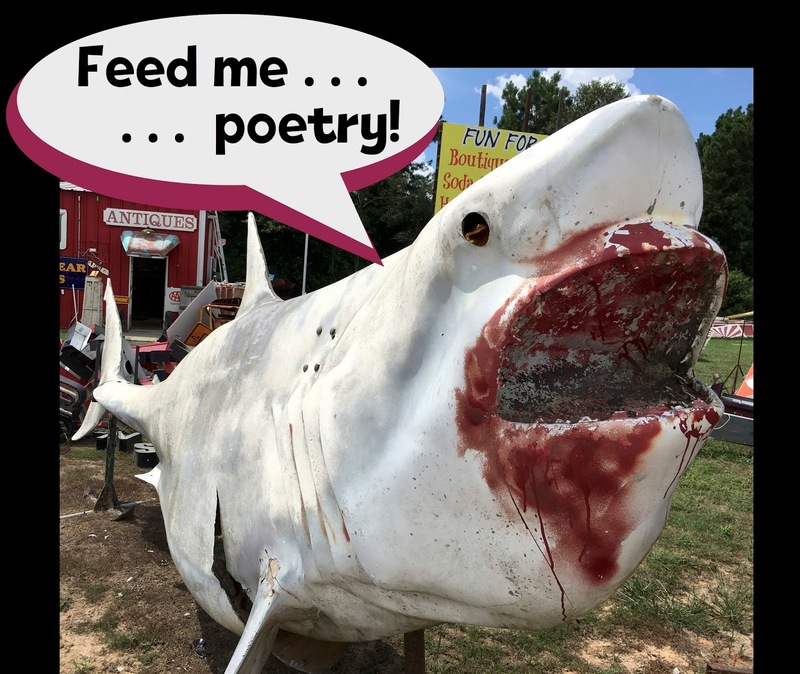 Big, Bad, and a Little Bit Scary: Poems that Bite Back! New York: Viking. Now head on over to A Word Edgewise where Linda is hosting Poetry Friday. I love shark week!! I'm actually running a kids nonfiction book club this fall, and I'm doing a shark-themed program, so I can't wait to share some shark poetry with my young readers!! I'm thrilled to find some more ocean poetry, just returned from a time at the beach! Last year at the same time we watched a neighbor 'wrangle' in a large "something" & it turned out to be a baby shark. He took care not to harm it very much, and released it. It was exciting to see! I know many of these, and thanks for new titles, too. I imagine Traveling The Blue Road will be lovely. Great title. Thanks for all! Shark week, thanks for letting me in on this, and this rich bevy of water related poetry books too! I'm familiar with Douglas Florian's "In the Swim," fun art and poems. That second curdling image, ooo! watch out. Sylvia, thanks for the shark poem by K. Coombs and the titles of additional poetry. It is quite a delectable array (I actually like shark meat on the grill). I watched Michael Phelps swim against the great white shark this week. Your line-up is far less dangerous than his attempt to out race the shark. Thanks for the great list of resources! I loved your tweet or was it facebook...let's focus on something friendly like shark week. Ha! It's a serious t.g.i.F kind of week for America. Great list! I had no idea there were so many books with shark poems. I have a shark poem, too. Here: https://friendlyfairytales.com/2016/01/29/tickle-proof-sharks/ They are fascinating creatures, aren't they? I've never paid much attention to Shark Week (except for that one year I binge watched while I sliced and diced veggies to make salsa), but these poems and collections look like fun! The closing photo made me snort! Thanks. I needed that today! Thank you for all the great shark poetry. It's a wonderful list of resources. And yay about the undersea poems collected, upcoming, from LBH. Thank you for all the book recommendations. I've added a few of them to my TBR pile. Another great fish poem book is Trout Trout Trout: A Fish Chant by April Pulley Sayre. It is fantastic. Somehow I missed that it was Shark Week, so thank you for catching me up on that. Your list includes many old favorites, and I'm looking forward to reading Traveling the Blue Road. Thank you for another terrific list, Sylvia! As if we needed proof that a big list of poetry could be found for any occasion! Fun stuff here. Plenty to sink our teeth into! As I always tell my students, poetry can be about anything! Great post!